menus ⋆ 100% Private Proxies - Fast, Anonymous, Quality, Unlimited USA Private Proxy! We currently have a Drupal 8 site that has subsites (accessed via subdomains). On the main site (non-subdomain) we have a main navigation menu defined (this is presenting correctly on the main site). On each sub site we have a domain specific main navigation menu defined (these are presenting correctly on each subsite). We have a footer menu that is used as a placeholder, defining only top level navigation items (no children). This footer menu is used both on the main site and each sub site. The footer navigation child items are cloned from the main navigation (if on the main site, the child links are cloned from the main navigation as defined, if on a sub site, the child items are cloned from the sub site main navigation as defined). This is working. We also do some clean up to remove top level footer items that arent present in the main/sub sites navigation menu. If we clear the cache & load the main site, we get the expected footer items shown. If we clear the cache & load a sub site, we get the expected footer items shown. If we clear the cache & load the main site, and then load a sub site without clearing the cache again, we get the main sites footer items presented, not the desired sub sites footer items. We have put in place caching directives for url.site which we believe should be recognising that the sub site and main site have different url’s and should be caching these footer menu’s separately. When I upgraded from Mojave 10.14.3 to 10.14.4, iStat Menus completely disappeared from my menu bar and I cannot seem to make it reappear no matter what setting I choose from within the main iStat Menus app. Is this a known problem? Any troubleshooting hints? I followed this tutorial but am having some issues. I enabled menu_link_extras and layout_builder on my site. I enabled layout builder on my menu, added a menu link and added a block to that link’s layout. No matter what I do I can’t seem to get the blocks I’ve added in layout builder to show on the page. Is there something I’m missing in getting this to work correctly? Need help on making my submenu collapsible. Currently the submenus take up too much space. How can I select mutliple entries from drop down menus? How can I select mutliple entries from drop down menus (with data validation) into a cell in excel sharepoint? I have only been able to replace and populate single selections from my drop down menus. Could SER get a way to buffer the choices in the Category pull-down menus on target sites? …because I’d like to translate them and learn the phrases that constitute the various categories in different languages. If there was a way to save the choices, just so I can enter them into G! translate and make a cheat sheet I print out or have in a file so I can learn them, that would be very useful. Hope all you guys and girls are having a fun weekend. It looks like a bug but I am not sure which program is to blame.. When this is done, Libreoffice has no menubar anymore. Adding the Menubar button and using it has no effect. But once the “Application” button is dragged away from the titlebar at System Settings > Application Style > Windows Decorations > (tab) Buttons, the menubar in Libreoffice comes back. I have a region with menus, a menus displays depending on the url example if on the about page(sitename/about-us), display about menu and links as a sub menu. It works, but the problem is after navigating through the site a couple of times, the region caches. is the anyway i can clear the regions cache on page reload. What is the significance of the three dots “…” on menus and buttons and how to use them right? Adding three dots after the title of items in a dropdown menu seems to be a common practice (as you can see on the picture of a drop down menu in Google Chrome). They generaly mean that there is “something” after clicking on it. These dots are also sometimes presents in the text of action links and buttons. What kind of information should be conveyed by these dots ? How and when to use them ? Is it realy relevant to the user, and easily understood by them ? How to always show keyboard accelator keys for popup menus? 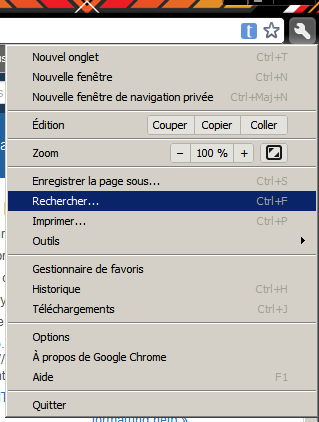 When opening a popup menu in Windows via the right mouse button, ever since Windows XP, the accelerator keys (i.e. the key to choose one of the popup menu items) are not visible anymore by default. Supposedly there is a way to set this as default behaviour, but where? 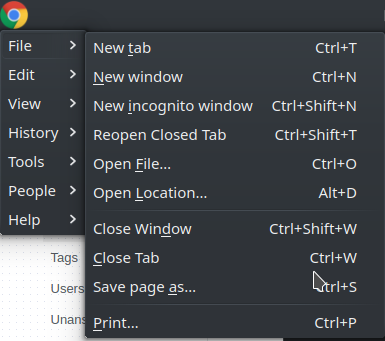 If I use Shift+F10 or the menu key (right of the space bar), the accerator keys are shown.